The four partners were sitting around in a coffee house and cribbing about the loss of green cover in Bangalore. They were wondering why no one was doing anything to help the city live up to its “garden city" moniker when it occurred to them that they could do something themselves. “There are actually quite a lot of spaces that you can green up in cities, but you have to open your eyes and look for them. 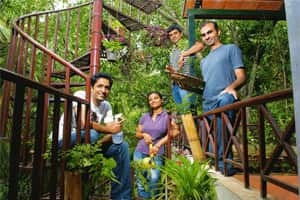 There are very few people who know extensively about how to optimize small spaces and grow something nice that you can enjoy," says Deshpande. They worked on the balconies and small patches of gardens in their own homes, sent “before and after" photographs to friends and associates, offered to do a garden at cost and birthed a business. They roped in a friend’s boss, who was willing to let them run a trial on his garden. They billed him at cost and used that garden as the showcase for potential customers. “The cash outflow was low because we worked at the garden ourselves, without hiring any employees. The real investment was in the time spent in tracking down vendors to supply the things we needed," says Chengappa. During the initial months, the group members went on site visits after office hours and implemented the projects on weekends. Typically, the team visits the site, works on the design and chooses plants in accordance with the client’s ability to maintain the garden. Then they go back and implement the design. Implementation is a day’s work. Lately, the group has introduced a “gift a garden" concept. Clients who have friends or family in Bangalore can contact My Sunny Balcony and have them execute a garden. “A typical balcony or terrace garden costs Rs14,000-25,000 and an outdoor garden can cost up to Rs40,000," says Chengappa. They have annual maintenance contracts and offer a range of organic pesticides. They are also exploring some franchisee options. If the business isn’t viable after three years, they figure they may go back to their day jobs. But with orders pouring in, that is a distant option. “The fact that we speak the same language as our client is our biggest plus point," says Aravamudan. “Earlier, clients had only two options; they could either hire a high-flying landscaping company and expect to pay at least Rs1 lakh for a premium garden, or hire a local gardener who would place five pots in a row and then disappear. For the modern, city-dwelling, upper middle-class garden lover, there was no one he could call to help get started on a nice, but modest garden. We understand what they want," he adds.